See iBibleCode OT at the iTunes App Store. With iBibleCode OT, Research Systems brings you a custom version of CodeFinder specially developed for the iPhone and iPod Touch. 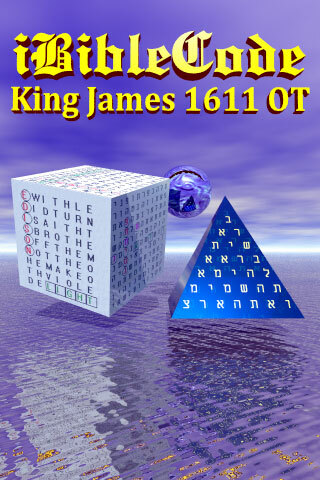 Incorporating the 1611 King James version of the Old Testament; iBibleCode OT allows you to find hidden Bible Codes similar to those shown on our CodeFinder New Testament codes pages. iBibleCode OT allows you to search for the main term of a matrix and to observe the phenomenon whereas the surrounding text is often, in some way, related to the embedded code. The, New Testament, JFK, Roswell, Marconi and Titanic matrices are all good examples of this. If you would like to progress to larger searches in a variety of other texts in English, Greek or Hebrew then the Window's version of CodeFinder is available for Instant Download from this site. Using iBibleCode OT is simplicity itself. Merely choose the approximate number of results that you would like to see, enter a word and, finally, tap the search button. 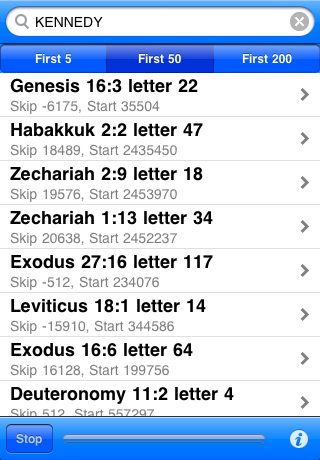 iBibleCode OT will then begin a search of the scripture text for embedded codes matching your search word. Note that the number of results expected is subject to statistical variation. Although iBibleCode OT does it's best, it may still show a few more or less results than requested. If you want to see the perhaps more significant results then select the 'First 5' button before searching. This will 'cherry pick' what the software has determined to be the more statistically interesting results. As embedded codes are found they will be shown on the screen directly. Tap the screen over one of these and the associated matrix will be displayed. You can do this even if the progress bar is showing that the search is not yet complete. The verse in which the word starts is displayed in bold. The other values indicate the skip value and start letter in the text. In general, lower absolute skip values have the higher significance. 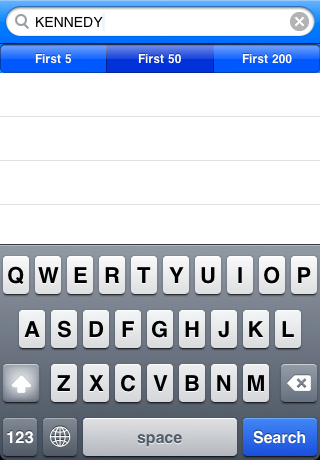 If the search is taking a little longer than you expected then just tap the 'Abort' button. This will drop you out of the search, whilst retaining any displayed results. When a result is tapped the matrix will be displayed. Within the matrix you will see your search word highlighted in red. Now is the time to visually scan the matrix for related text. 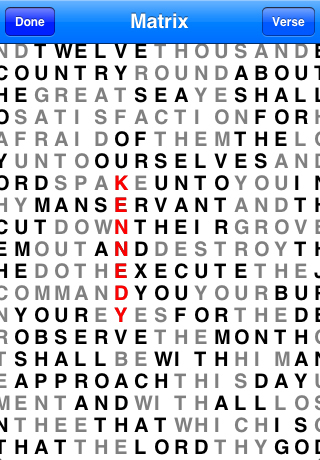 Obviously we can see 'Execute' starting from the second 'E' of Kennedy and 'Destroy' one line above that. Examples of related searches are shown in our CodeFinder New Testament codes pages. Finally, you may be interested in viewing the verse in which the search word starts. For this just tap on the 'Verse' button. When finished just tap 'OK'. Download from the iTunes App Store.